As you have likely heard us discuss on a multitude of occasions this year, this has been one of the more boring years weather wise in a long time. The one good thing about it being a boring weather year is that tornado counts were down. But, it was monotonously hot June, July, August and September. July was the one exception this year, with a major rainfall event occurring at least once a week for three of the four weeks. Outside of that (and you can see this in our Events of the year), there were only a few big events this year. And the majority of them weren’t event severe weather related. There was a historic Blizzard in January, two hurricanes in the fall, and the occasional tornado events in May in August (August???). It was a weird year. 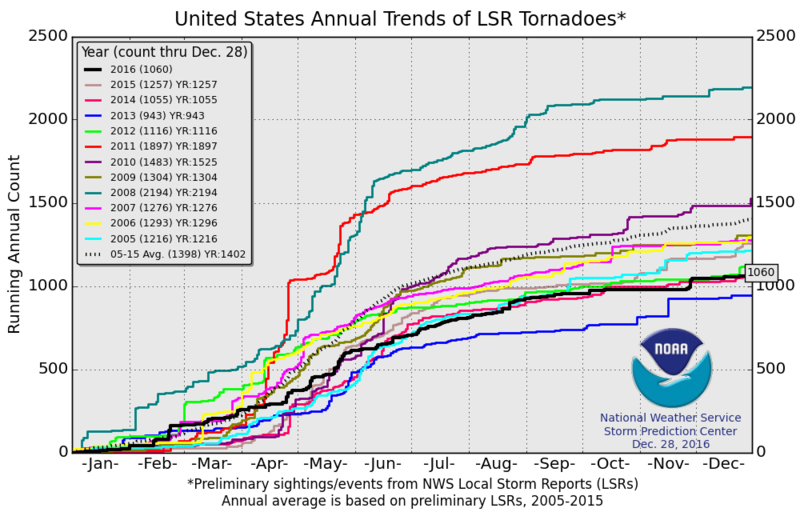 But it was especially a slow year for severe weather, which is a very good thing. It has really been slow, outside of a few events, since the infamous 2011 severe weather year, in which April had over 700 tornadoes. This year has been the third slowest tornado season since 2005, and only by 5 tornadoes. 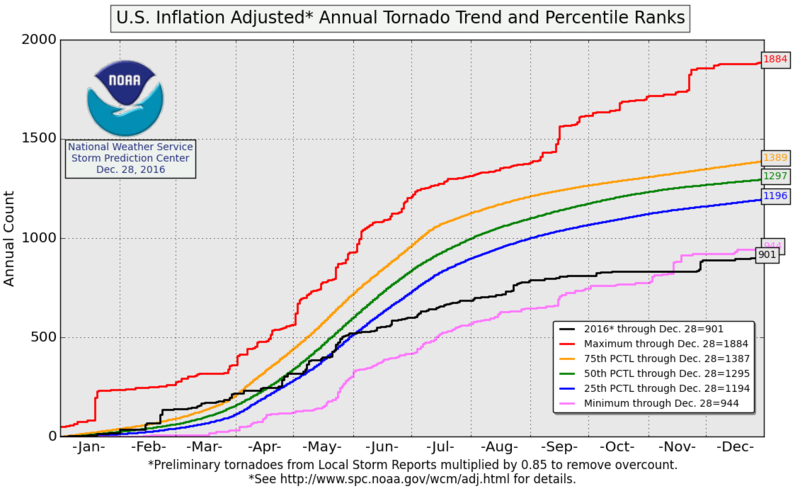 But if we look at preliminary numbers that are adjusted for report inflation, we see that there is a potential for this year to be close to the lowest tornado number on record. The year is currently on pace for it, actually (if the inflation adjusted numbers hold). This has led to a major positive from all of this. USA Today wrote a piece about the low numbers for tornado deaths this year, and the statistics are amazing. “Tornadoes killed only 17 Americans this year, the fewest in 30 years…”, the article wrote. This statistic shouldn’t come as a surprise, however, given the nearly record slow year. Additionally, the SPC has gone another year without issuing a High Risk for severe thunderstorms. This is a really good measure for seeing how active the year has been severe weather wise as a whole. While outlooks can be deceiving, as they can bust and do bust a bit, the SPC has a very good track record in terms of having their Moderate and High risk days verify. Not surprisingly, the past two years have lacked High Risks, and both have been quiet tornado and severe weather years. The fact that tornado related deaths are down this year is quite exciting, and encouraging. Remember, in 2011, over 500 people were killed tornadoes, and the majority of those came in two days (4/27/11 and 5/22/11). Hopefully the numbers are down not only because of low tornado numbers, but also improved communication from the Weather community. We must continue working on the issues that plague our communications, and we will continue to work for low tornado-related death numbers. For more info, read the USA Today article here.